One of the easiest - and oldest - ways to make a small object disappear; the finger palm is a classic bit of sleight of hand. The magician displays a coin in his right hand and then holds out his left. With a casual motion, he dumps the coin from right to left hand, making a fist of his left as he does so. 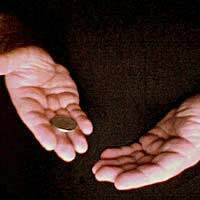 With a wave of the hand and a magic word, the left hand opens to show that the coin has vanished. The key here is the natural “pocket” formed by the fingers when the hand is held open, but relaxed. A decent sized coin will snugly fit between the inside of the fingers and the “meat” at the top of the palm. Nothing is required beyond the object to be "vanished". Plenty of practice and you are ready to go at a moment’s notice with no set up. The finger palm vanish is actually two moves - the actual finger palm and the vanish. The first is mostly sleight of hand (and thus requires loads of practice) and the latter is mostly showmanship. Any palm is, as the name suggests, the securing of an object in the palm of the hand without its presence being detectable. This means that natural motions and misdirection are as key as the manual dexterity required to pull it off. Place the object to be vanished (we’ll assume it is a coin, but it could be any object small enough) in your right hand, on the fingers, not the palm. Your hand should be out, a little over waist height, palm up. Hold out your left hand in the same manner. Pass your right hand over your left, turning your right hand over and letting the coin drop into the left. Immediately close your left hand over the object into a fist and raise it to about eye level. Your right hand can drop casually to the side. Now repeat the same move, only this time as your right hand turns over, curve your fingers slightly. This should trap the coin between your fingers and palm. Complete the motion as before, with all of your attention on the left hand, as if you actually placed the object there. Making any object disappear is, as stated above, equal parts mechanism and acting. Your mannerisms, where you look, what you say, your body language all play a role in convincing your audience that the object is right where they think it should be. In the above instructions, you can simply ask a spectator to blow on your closed fist, say a magic word, or pretend to squeeze the coin out of existence, then dramatically turn over and open your left hand. Viola! The coin has vanished. As is important with any magic trick requiring sleight of hand, practice the moves over and over again until you can do them in a completely natural manner. Once you have the Finger Palm Vanish down you will find yourself using it in dozens of other tricks, vastly increasing your range.